Having attended the Grand Session of the Most Worshipful Prince Hall Grand Lodge of Arkansas just last month and sat and talked with the Honorable Cleveland K. Wilson, Grand Master for hours, I can assure you that the story that Prince Hall Arkansas does not desire recognition is a big fat lie. I've heard the same thing second hand in Florida. Georgia, Alabama, West Virginia, etc, etc. Keep turning the other way and you all will be biten. Then what? The old "they don't want integration" was used by southern racists to justify maintaining segregation throughout the civil rights fight. Feh. It was a common chant in the school boards of Boston up North, as well. Just sayin. 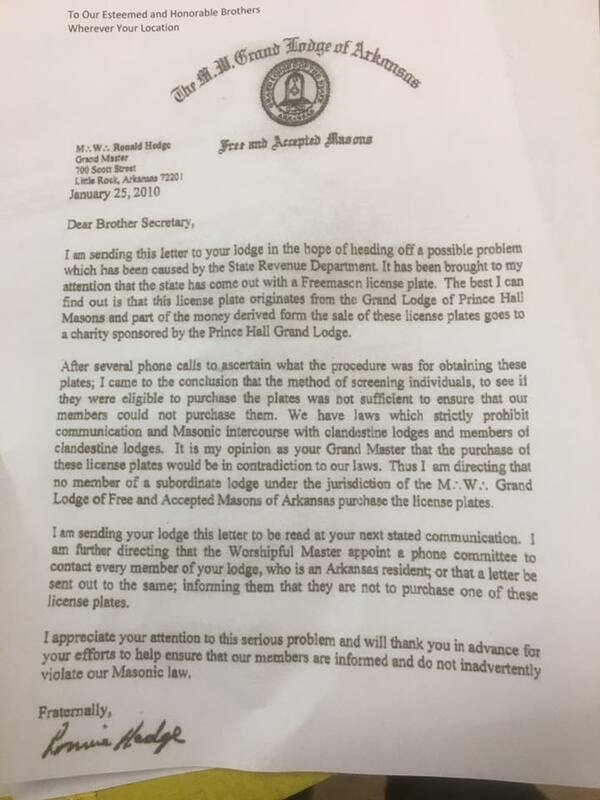 I have stacks of emails from Masons in many states with stories about frankly appalling decisions, actions and behavior by grand lodge officers over the last dozen years. I'm sure Fred Milliken and Widow's Son have them as well. I have no desire to drag them across the internet—much of it is gossip, much of it is hearsay, much of it is hard to prove. But much of it is not. What is fast becoming clear is that some grand lodges have recently become nervous about embarrassing statements and edicts being leaked to the public, and worse, being posted on the internet. Funny thing about this technology, the way it shines a bright light on things that don't look so good when they are all lit up. There is no question that not every grand master is perfect. The level of imperfection varies wildly, but there is a certain type of person who believes he has absolute power to rule with an iron whim, exact revenge, and in short, behave in ways that absolutely fly in the face of everything our fraternity teaches us. Fortunately, such men with a misunderstanding of their position and duties don't often make it to the Grand East. Unfortunately, enough do that there are Masons who live in fear every day for their dues card, who fail to stand up for what is right and proper because it's hard to do if the choice is shut up or be expelled. But allowing politics, revenge, racism, criminal misconduct, and worse to enter into the highest levels of the fraternity is something no Mason should stand by and allow to happen without demanding better leadership. Both of my folks are from Louisville, Kentucky, and I have lived part of my life in Virginia. My father lives in Georgia now. I've seen racism in the Deep South, and in the North. Ignorance knows know boundaries, and I learned long ago not to get fooled one way or the other by accent and diction. I don't see "South" and automatically think of banjo music and rotten teeth. But there is no dodging the fact that all of the states left in the US that do not recognize their Prince Hall counterparts are, with the exception of West Virginia, members of the Old Confederacy. There are states where lodge officers and grand lodge officers are trying hard to make changes. There are other states where an entrenched old guard would rather that Freemasonry die than let a man of a different race pass the Tyler's door. And the same is true on both the mainstream side and the Prince Hall side. We've all heard the excuses, and it's embarrassing that they are the same ones trotted out back in the days of Brown v. Board of Education of Topeka. You'd have thought the least that could happen would be some new ones invented. The point is, it's not 1954 anymore. I had an Atlanta police officer (much younger than I was) who was a Mason literally poke me in the chest and tell me I was destroying Freemasonry by allowing black men to join my lodge, that black men could NOT be Masons because of the Ancient Landmarks, and that "down here we know how to treat 'em." I'm sorry, but that cop needs to be up on Masonic charges (and possibly before a civilian review panel, as well). The same goes for any grand lodge officer who shares those sentiments. There is no place for it in a fraternity that trots out the cardinal virtues and proclaims universal benevolence in one breath, and then proves they know nothing about the subjects in the next. And I have no illusion that there aren't Prince Hall Masons who would rather open a vein than let a white man in his lodge, as well. Our petitions are color blind, and our fraternity should be too. I'm not a big one for demanding that other grand lodges use the nuclear option and drop fraternal relations with the openly racist jurisdictions. It only hurts sojourning brethren, and it threatens the sovereignty of the grand lodge system. In the 1870s, New York accused Indiana of destroying the fraternity by prohibiting alcohol in lodge rooms, and threatened to withdraw recognition over it (They were probably right.). More recently, the imbroglio over the Grand Lodge of France and Minnesota brought down the wrath of Michigan, New York and other GLs, when clearly they had absolutely zero justification. One man's justifiable reason is another's personal grudge. But the time HAS come for grand masters outside of the Confederacy to start making noise and whispering good council in the ears of their Southern brethren. Prince Hall recognition has been an issue since 1948. It's been 62 years, and for nearly 20% of the United States to still be having this argument is a disgrace. Young professional men don't find discrimination in their businesses, housing, transportation, or lunch counters. For it to exist in their fraternity is appalling. For the record the Grand Lodge's attitude towards drill weekend really isn't anything new. My experience of society as a whole has been "Well either do your drill or do your job." The fact that a Grand Lodge is saying the same thing really isn't surprising. Doubtful anyone in the front office served, and if they did it was usually on the active duty side and have little to no knowledge of the commitments and dedication it takes to both keep a civilian job and serve in the military. I have been accused of hiding behind my reserve duty, and I work for the Federal Government! So an all volunteer organization having the same attitude seems reasonable, however misguided it maybe. Your comment here that begins "I have stacks of emails..." is undoubtedly the finest essay I have ever read by you. It should be posted as its own article on your site and reposted on other blogs. Nicely said. I agree strongly with everything you have said with the exception of pulling recognition. That needs to be done. My path has been one of not only words but action. The notion that this type of behavior within Freemasonry will die out when the older generation passes is false. The racism and culture of Segregationists as well as the infiltration of the KKK breeds a whole way of life, a culture that is transmitted from one generation to the next. Like the Branch Davidians these people have dug in and are not budging now or in the future. Consequently you will not be able to sway them with just words. You cannot convince a closed mind. Bold, decisive counter measures are all these people will understand and that is why I have dedicated myself to do more than just try to jaw them down. And for the future I can see US Freemasonry being dragged into civil courts and prosecuted for civil rights violations. Not only in the light of the current administration that we have in Washington but also because if a Grand Lodge has incorporated then the statues of incorporation - civil law - and federal tax laws now govern that Grand Lodge and take precedence over any Masonic tradition or personal rules and regulations that the organization might hold dear. Thank you both for your well reasoned, sincere and convincing posts. You do the Fraternity proud. I would also agree that this is a significant enough issue that the way that this should be handled is: Non-racist Grand Masters should start making a great deal of noise on the issue, followed up by the very real threat to break off fraternal relations if the issue isn't properly addressed. This is the 21st century, and for Masonry anywhere to be perpetuating racist dogmas is unacceptable. I consider Prince Hall Masons in areas behind the "Gray Curtain" to be more faithful brethren then those in so-called "regular lodges" who are flouting everything Masonry stands for by either actively supporting these policies or silently standing by. If Masonry is to have a future (and as a young Mason I hope that it does), it must not die out due to outdated beliefs, outmoded prejudices and cultural or racial suspicion. When I took the 1st degree it was required that I be a "man, freeborn, of lawful age, and well recommended." Race should have no place in the qualifications.